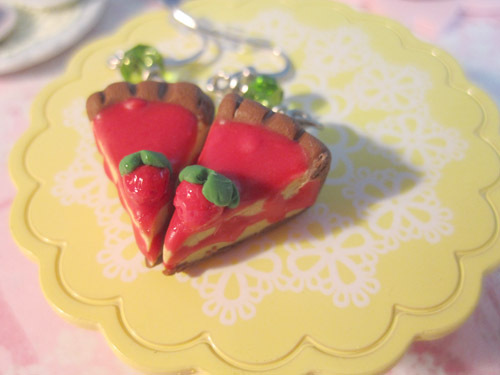 This month you could win cute Royal Tart Slice Earrings part of my new tart line! Good lucky to everyone! more info on the earrings here: Royal Tart Slice Earrings These earrings where inspired by Adventure Time, a must see show This episode found here: The Other Tarts Enjoy! Make a new comment for each one of your entries (otherwise it gets to hard to count them :). I will pick a random winner monday May19th . Good luck kawaii lovers! Ooo, yumyum, I'd love to win these! i like the red super mario mushrooms, :) very cute. i like this ring. very cute. Awws, they are soo cute. I would love to start adding food items to my earring collection especially desserts. I love baking, soo this would be awesome. Great work! These tart earrings are yummy! Thanks for the lovely giveaway. This 3 donut tie clip would be the envy of all the guys! I follow with gfc, thank you. I like CandiWare on FB (jc loh), thank you. thanks for having this giveaway ! very cute products candiware sells . enter me please, i want to win. Hi! I follow via GFC. Those are really cute - and delicious. I love your other cake earrings too. I went to your shop and had a hard time picking a fave item.. they all look so delicious :) But I pick the Romantic Tea and Milk Ring as my favorite. I love clay polymer jewelries. I have never worn them but I would love to especially if the design is as yummy as that strawberry pie. Chocolate Bundt Cake With Blueberries Ring -- it even has a fork in it. How did she mold that?!!! I'm new fan on facebook! I'm new fan on this blog! These look scrumptious and adorable! Become a fan for the CandiWare's Facebook fanpage as Monika Lintang Retnani. Follow this blog as Monik. I am loving your chocolate chip bobby pins! Yumyum, I'd love to win these! Love the banana split cupcake ring in your shop. I'd love to enter the giveaway. The earrings are awesome! I like the Chocolate Cupcake Earrings (pink). I'm a fan for the CandiWare's Facebook (username: Gabriela Luzon Castillo). I follow your blog as Gabriela. Thanks for awesome giveaway, those earrings are so cute! I love the Hello Kitty Cameo necklace!